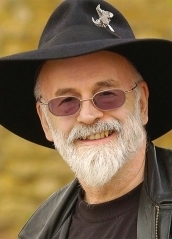 A second giant loss for the kingdom of fandom: Sir Terry Pratchett has passed away. An author lives whenever a person reads his stories. Pratchett, therefore, is sure to brush on as near to immortality as humanly possible. Because we never stop needing to laugh, and we never stop searching for the themes of life, death, family, and being a hero when it's least convenient. Here's to Terry Pratchett, a great author, and by all accounts a great man as well. May his books make him a little more real than time itself, for he will be missed.